When I said “I do,” I really meant it, because I’m a doer. Just ask my wife. Sometimes I’m a doo dooer, which is not so good. Just ask my wife. But this time I’ve created something I’m really proud of. 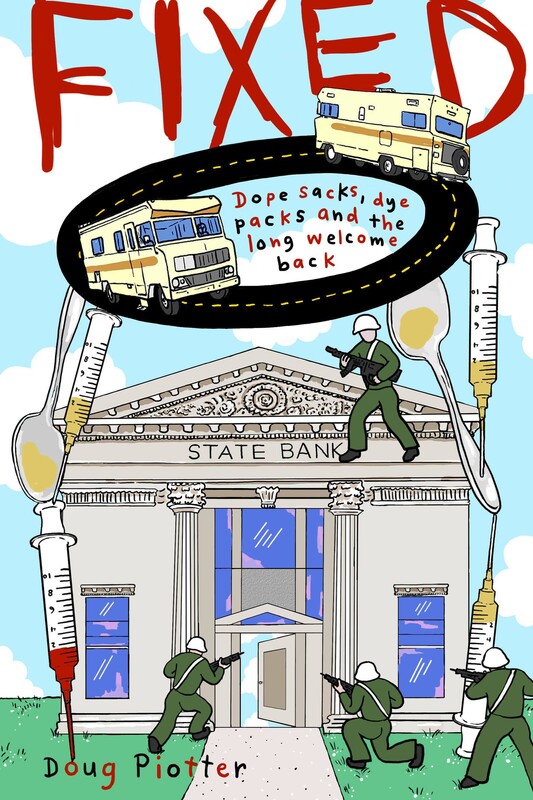 I”m also proud of my fabulous illustrator Edie Everette, who captures my twisted stories and untwists them in the form of illustrations for my upcoming book Fixed: Dope sacks, dye packs and the long welcome back. Here is the book cover art she just finished for me. It’s brilliant. If you like the cover, you’ll love her illustrations inside the book. I’m a huge fan of her work. I hope you are, too, and hope it helps to inspire you to buy a copy for yourself. If you want to get on the list to pre-order the book this summer, subscribe to my email list here. I welcome all positive feedback. Thanks for being my glass half-full kind of people. Cheers. Love the cover Doug!! And I can’t WAIT to read your book!